Hino Matsuri on May 3. More Hino photos here. Google Map of Hino here. 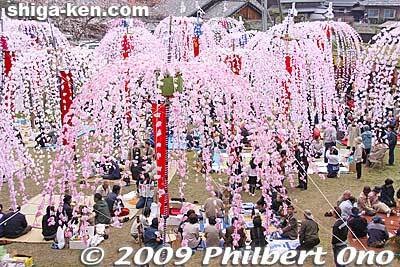 Hino-cho (日野町; Hino-chō) is a town in southeastern Shiga Prefecture. In area, Hino is one of the largest towns in Shiga. Although it is landlocked, surrounded by much larger cities, and serviced by only one train station, Hino can well hold its own with major festivals such as the Hino Matsuri in early May and major sightseeing attractions. The town is quiet and rural, and certain areas are noted for traditional townscapes. Hino's history features old castle ruins, Lord Gamo Ujisato who developed the area (before moving to Aizu-Wakamatsu Castle in Fukushima Pref. ), and Hino shonin merchants who produced and sold their merchandise all over Japan. A few of their large, Japanese-style homes can still be seen (and toured) today, such as the Omi Hino Merchant Museum. Shingyoin Temple 信楽院 - Graves of the Gamo clan are here. Also known for a painting of a dragon on the ceiling. Sept. 1 - Omi Nakayama Imo-Kurabe Festival 近江中山の芋競べ祭り. Festival comparing the length of yam stems to foretell the year's harvest. There is a tourist info office at Hino Station and the main tourist info office in Okubo on the main road. There is not much near Hino Station, so take a bus from the station to other parts of Hino. The center of town is Okubo, a short bus ride from Hino Station. The local international association has a rough town map in English pdf file here and here. Hino is lucky to have Hino Station, its only train station, on the Ohmi Railways Main Line. However, Hino Station is not at the town center. Take a bus from the station to the town center or other destinations. From Tokyo Station to Hino Station: JR Tokaido Shinkansen to Maibara Station (2.5 hours), then transfer to Ohmi Railways for Hino Station (60 min.). From Kyoto Station to Hino Station: JR Tokaido Main Line shin-kaisoku to Omi-Hachiman Station (31 min. ), then take Ohmi Bus to Hino Station (40 min). From Omi-Hachiman Station to Hino Station: 40 min. by Ohmi Bus. Go to the south side of Omi-Hachiman Station and catch the bus bound for Kitahata-guchi 北畑口. Buses leave about once an hour. Bus schedule here. Hino Station - The only train station in Hino town. Nothing much here, so take a bus from here. Buses available at Hino Station going to the center of town and farther areas. Rental bicycles available in front of Hino Station and at the tourist office in central Hino near Okubo. Placemarks in Google Maps are in English. Click on upper right icon to enlarge. More photos at Hino-cho Photos. More Shiga photos here. Other sights in neighboring cities/towns within easy reach from Hino-cho. Higashiomi - Near Yokaichi Station is the Higashi-Omi Kite Museum. Minakuchi - Near Minakuchi Jonan Station is Minakuchi Castle. 1582 - Lord Gamo Ujisato starts to encourage commercial activities in Hino, laying the ground for Hino merchants to prosper. 1584 - After victories in battle, Lord Gamo Ujisato is rewarded with a fief in Ise (Mie Pref.) and moves away from Hino. During the Edo Period, Hino merchants prosper by selling mainly medicines and lacquerware. 1955 - Six villages merge to form Hino-cho town. Hino-cho is one of the few towns in Shiga which have not merged with any neighboring municipality. Aizu-Wakamatsu in Fukushima Prefecture was named after a place in Hino called "Wakamatsu no Mori" 若松の森 by Hino-native Lord Gamo (Gamoh) Ujisato who founded Aizu-Wakamatsu. For many years, there have been proponents for building an airport (Biwako Airport) in Hino. However, due to stiff local opposition, the project is frozen. You may still find airport opposition signs in Hino. Born in Hino, and became Lord of Gamo region which includes Hino town. Served under Oda Nobunaga and Toyotomi Hideyoshi. Married Nobunaga's second daughter Fuyuhime at age 14. Revered for developing Hino to enable Hino merchants to prosper. Later became lord of Wakamatsu (Tsurugajo ) Castle in Aizu-Wakamatsu which he founded and developed in Fukushima Prefecture. 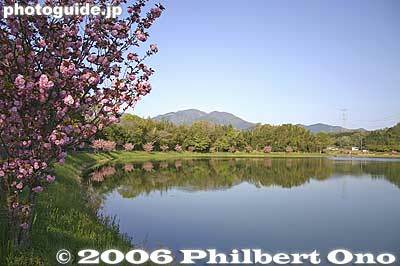 He named the town Wakamatsu, after a place called Wakamatsu no Mori in Hino. He is revered in Aizu-Wakamatsu as well. Died suddenly at age 40. One theory says that he was poisoned by Toyotomi Hideyoshi. Ujisato was also a Christian lord, so it is ironic that he is buried at a Buddhist temple in Kyoto and Aizu-Wakamatsu. Freestyle moguls skier who represented Japan at the Torino Winter Olympics in 2006, the Vancouver Winter Olympics in 2010, and Sochi Winter Olympics in 2014 when an injury prevented her from competing. 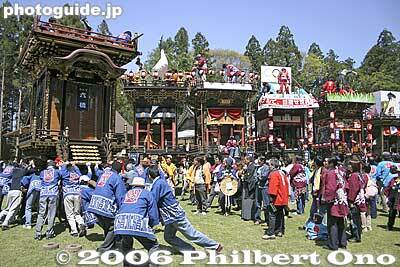 Hino Matsuri - Guide to the festival in Japanese. This page was last edited on 7 December 2018, at 01:36.